Vibrance Nutrition and Fitness | Don’t Let Stress Make You Fat! You are here: Home » Primary Food » Don’t Let Stress Make You Fat! Don’t Let Stress Make You Fat! When you’re under stress, it is harder to eat healthier. You may find yourself eating high calorie foods at a time when youâ€™re stressed and may not even be hungry. Much of this stems from the hormonal response internally – stress hormones ramp up the urge for cravings as a means of self-medication. Salty, crunchy or chewy snacks relieve stress by working the jaw and bringing a sense of focus; creamy and sweet snacks relax and soothe the senses through the release of serotonin and other calming neurotransmitters. 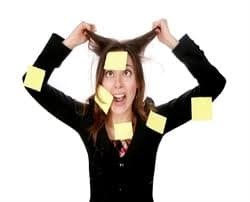 The stress of overwhelm and multiple choices taxes the brain and actually consumes a great deal of glucose, which can lead to cravings as well. How can you fix the weight gain during stress? It is ESSENTIAL to get a handle on the stress. When you decrease the stress, you will feel back to your old self and find it easier to eat healthier and have better exercise habits. Things which set you off or feel too hard now will suddenly, effortlessly, become far more manageable. When you feel stress increasing, take some time to lessen the stress. Go for a walk, go to bed early, unwind with a good book or a hot bath. TV and computer does NOT soothe the body, and can exacerbate insomnia and other physical stressors. Yoga is a powerful way to relieve stress in the body as well. Take a yoga class after work to let go of your day, or tackle stress with yoga in your own home! Bridge pose. This is designed to calm the brain, rejuvenate tired legs and relieve spinal tension. How: Lie on your back with your feet hip-width apart and flat on the ground. Press down with your feet; lift your glutes, hips, pelvis and back off the ground. Keeping your arms flat, with your shoulders on the floor, lock your fingers under your glutes. Inhale and exhale. Standing forward bend. This stretches tight hamstrings and relieves tension in the hips and lower back. How: Stand straight, feet hip-distance apart. Exhale and bend, bringing the crown of your head toward the ground. You’re far enough when your hamstrings are stretched, but not tight. Put your right hand on your left elbow; release and switch. Yoga is already a great way to de-stress but not the only thing you can do. Here are three more ways that can you take your body back and get rid of the stress. â€¢ Physical activity at your local gym. Check if they have drop in classes for kick boxing, boot camp or another high- intensity class, especially if you feel wired and ramped up. â€¢ Sleep: are you getting your 8 hours? If not, sleep is the most important piece to help with your stress. â€¢ Don’t skip meals, especially breakfast. Itâ€™s your body and your life – don’t let stress take it over! What is one way you will nourish your body to reduce your stress today?